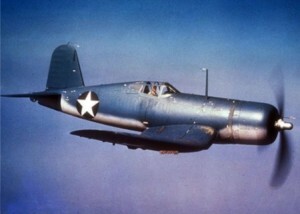 On March 20, 1945, Ensign Richard C. Forisso was piloting an F4U-1D Corsair, (Bu. No. 50513), over Plymouth Bay making practice bomb runs. At one point while at 4,000 feet, hydraulic fluid and gasoline began spraying from under the instrument panel followed by smoke filling the cockpit. The fluids got all over the pilot’s lower extremities and partially obscured his vision. Ensign Forisso elected to stay with the aircraft and aim it for a safe area of the water away from shore and watercraft. He cut the engine and made a wheels up water landing, suffering minor cuts and bruises in the process. He was able to escape before the plane sank to the bottom. Maintenance records showed that the hydraulic lines on this particular aircraft had broken twice previously. Rough weather put off the recovery of the aircraft for four days. Once it was recovered, mechanics discovered a 1/2 inch crack in the hydraulic line behind the instrument panel. This aircraft was later scrapped due to the time it had stayed submerged in salt water.